If you can find the time to spare to go an hour from Tokyo into a sleepy industrial part of Yokohama near Shin-Koyasu station, you will find the original factory of Nissan Motors. Inside are a plethora of Nissan engines, and a very friendly curator who will walk you through the automaker’s history. 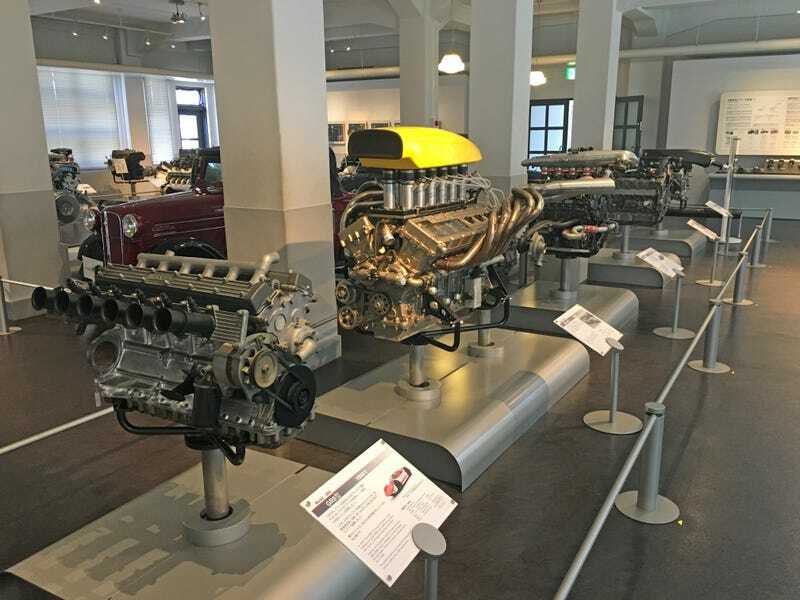 Of course, this is an engine museum, so the bulk of the space is devoted to various models of Nissan engines. The museum space is actually the original factory and offices built by Nissan in the 1930s. It was used as office space well into the 1970s, but now serves only an education purpose. The building behind it, however, still produces one model of Nissan vehicle, and the museum does showcase a few current model vehicles and two classic vehicles. But that’s not really what the space is for. After viewing all of the diecast collection, I returned to the bottom floor where I met up with the museum curator, Maeda Hiromasa (前田博正), who had a lovely conversation with me about the history of Nissan in the area, the history of Datsun and Nissan in America, and the return of Datsun in India. I told him that Datsun had many fans in America, especially in terms of the Z, and that many of Jalopnik’s readers might applaud a return of Datsun to the North American market. To that, Maeda had no good news, I am afraid. But Datsun’s original reputation in the U.S. for small, reliable, affordable cars is perfect for India and other emerging markets. That’s unlikely, for obvious reasons. And it’s potentially even more awkward as we talk about the history of Aikawa Yoshisuke. There are some dark historical clouds hanging over Nissan’s founder. Aikawa was pretty much of the elite class during this era in Japan, and he had a top-notch education. Despite this, as a young man, he pretended to be a lower-class uneducated immigrant after financing a trip to the United States where he studied the malleable cast iron technology of future rival General Motors. So, it’s not particularly far-fetched to say that he dabbled a bit in what we might call corporate espionage today. But that’s relatively minor compared to what happened after American occupation forces set about rounding up and trying Japanese war criminals. For almost two years Aikawa was held in the notorious Sugamo Prison on the suspicion that he had committed war crimes while running corporate monopolies in Manchukuo, the Japanese Imperial puppet state in Manchuria, and using slave labor in manufacturing of military equipment at Nissan. He was eventually released, but banned from holding a corporate executive position in the future. He went on to serve in the reestablished Japanese government and his legacy is generally rehabilitated in Japan. There is some evidence which may suggest even that he was displeased with the behavior of the Japanese army in Manchuria and that he resigned his position in protest. On to more pleasant topics. You can also just get your EV charged at the museum if you need to do that. Okay, now enough history and EV technology, let’s get to the engines!